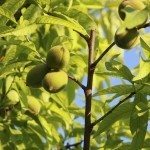 My peach tree is attacked by insects and consequently the fruits are no good. How do I control insects attacking the fruits? How do the fruits get bigger? What type of fertilizer I should use?